Gaze upon the beauty of your reflection and the beauty of this vanity mirror that features a winged Scarab motif. 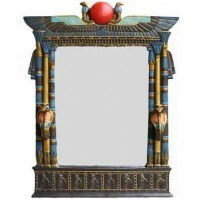 Amazing Egyptian design vanity mirror is cold cast resin measuring 12 inches high. The center flips to reveal a mirror on one side. Beautifully detailed and hand painted. Item Number: YT-6611 | Approximate Size (Inches): 0.00 wide x 0.00 deep x 12.00 high | Approximate Shipping Weight: 8.00 lbs.